Millennials. The generation of lazy, narcissistic, self-righteous, participation trophy-toters. As one of those very Millennials, I can attest to the bad rep that we have. Gen X co-workers don’t know how to work with us, and our Baby Boomer bosses struggle to understand how to connect with us. We realize there’s often a disconnect between the generations in the workplace, so I’d like to help shed some light on what we need in order to thrive. Create a healthy team environment. As my office frequently notes, we spend more time with our co-workers than we do with our loved ones. In our pursuit of lifelong happiness, Millennials place great importance on company culture. We not only aim to attain a nice work-life balance, but (call us crazy) we want to actually enjoy going to work each day. In his TED Talk, neuroscientist Matthew Lieberman, PhD., explains the importance of a supportive atmosphere in the workplace. He argues that social connection is the most basic motivator that fosters trust, connection, cooperation, and collaboration within an environment. Additionally, when we are socially motivated, it helps us to be smarter, happier, and more productive. Thus, being in a happy and healthy atmosphere encourages us to work harder in order to complement our team members. It’s important that Gen X realizes that Millennials have been closely judged, watched, and graded our entire lives. We depend on constant feedback from others in order to gauge if we are meeting expectations. Although it may be bothersome or seen as needy from our Baby Boomer bosses, it is actually enormously beneficial to both parties. The reason that we ask for continuous feedback is not because we want you to keep telling us how great we are; it’s because we are constantly trying to learn and grow. We are always hoping to exceed expectations so that we may gain recognition once we do. We don’t do well in an idle environment – we want to be challenged. Now, when I use the term “feedback,” many people think that I mean praise. While everyone loves approval, Millennials are quite accepting of constructive criticism as well. We have become accustomed to hearing both positive and negative feedback. We are under no illusions that we are perfect workers. In performance reviews, we would prefer to hear something positive and learn something that we need to work on, rather than purely positive praise. Additionally, with the Great Recession being one of the defining events in our lifetime, we have big trust issues about job security. We want to know if we are doing well and, if not, we’d like to know why, so that we can adjust our behavior. Older generations may view the offering of negative feedback as confrontational or awkward, but for Millennials, it is expected. If you struggle with giving feedback to Millennials, business strategy expert Karl Moore shares his S.M.A.R.T. model that outlines how to provide meaningful feedback. Being transparent goes hand-in-hand with offering feedback and creating a healthy work environment. 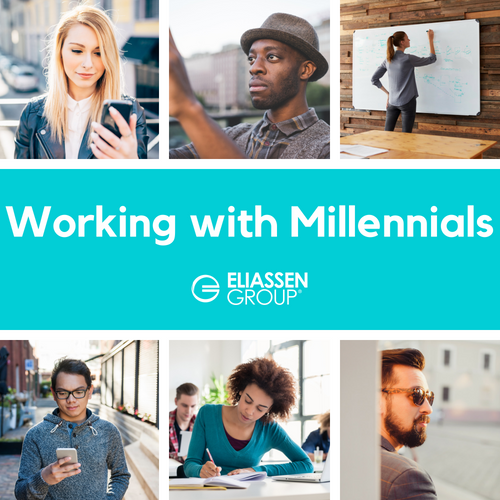 Trust is a major key for Millennials in the workplace; thus transparency is incredibly important to us because it is the basis of our relationships with you. As I’ve said, we want you to be honest about your feedback but in addition to that, we need you to address problems as they arise. If people are abusing the flex time policy, for example, we need you to blatantly sit us down and tell us there is a problem. Open communication helps to solve problems quickly and avoids all of the nasty pent up feelings we get after suppressing an issue for a long time. Additionally, when you address the problem head on, we are able to come together to determine a solution that works for everyone resulting in greater trust, respect, and understanding within the group or as individuals. While one-on-one communication is important, Millennials also value information sharing across the company. In our opinion, the days of “need to know” information are long over. When you share news or companywide goals, it helps Millennials to see and understand the big picture. Being transparent with your millennial employees helps them to understand the importance of their role as it contributes to company goals. Picture this: You’ve just started a new job and you’re listening to a “welcome” speech from an executive. At the end of his speech, he quickly adds, “If you have any questions, concerns, or ideas, don’t hesitate to reach out. We’d love to hear from you!” You may choose to keep your head down, do what is expected of you, and hopefully get promoted in a few years. Depending upon your personal goals, these may be reasonable expectations. But when a Millennial hears that speech they think, “Awesome! They want to hear my ideas – I matter to this company, and I can contribute to its success!” If you’ve challenged us to share our ideas, then you need to follow through. It’s so common for companies to say that they want to hear their employees' ideas and feedback. Aim to be a company or a manager that actually takes the good ideas and sends them up the chain. We understand the value of tradition, but we’ve been taught that innovation is the key to success. With Millennial millionaires like Mark Zuckerberg and Drew Houston, who says you need to be a genius college drop out in order to have the next big idea? Finally, we want to you invest in us, both financially and emotionally. Train us and build relationships with us. We want to know you. We want to know about your past, your family, even what kind of cake you like. Millennials struggle with work/life separation in the sense that we want to feel a personal connection to those around us. By opening up - no matter how unnatural it seems - it will create a sense of trust that Millennials will greatly value. When you invest in us, we invest in you. People rarely stay at a company because they love its business model or the work they do. They stay loyal to a company because of the relationships they’ve built. So, to our Baby Boomer bosses and Gen X managers, with great power comes great responsibility. Take the time to understand why Millennials are the way we are; it’ll benefit you in the long run. Besides, love us or hate us, we’re clearly here to stay, and we want to be strong, collaborative employees and bring value to the companies we work for. Looking for more effective ways to bridge the gap between multiple generations of workers? We’re happy to help! Reach out to us at: solutions@eliassen.com. "I sincerely appreciate Eliassen's continued support, never-give-up attitude, high professional ethics, perseverance, follow up and care."